← Ring in the New Year with Fun Classroom Lessons! Thank you. This is a great tool. Do you show your students the circle with points? If so, what do you do if they have to get say 20 points instead of 12? Anne, the circle is easily made and adapted using Geometer’s Sketchpad. I used color on the blog, but I might use a combination of dotted lines and/or old lines if I am making Xerox copies. The points can definitely vary; usually, the point goal will require a “basic” students to complete all A problems, and a number of B problems, while at the same time allowing an advanced student to complete all (or many) of the C problems only. 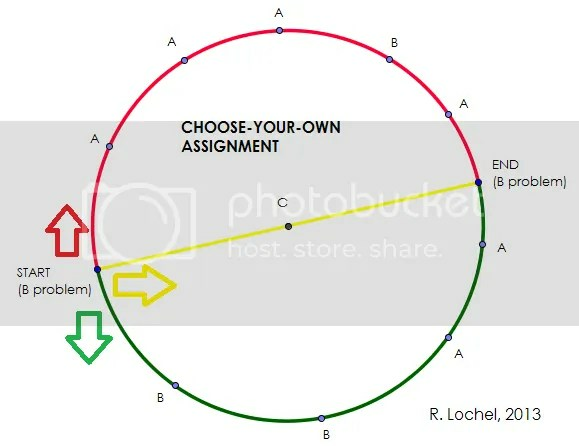 It really depends on the nature of the assignment. What do your students do when they have finished their required work? ie. the fast finishers? I always have a bank of challenge or extension problems at the ready. I look at math contest problems to use as challenges, and also have a bank of famous puzzles I use. Here’s on puzzle I have used: https://mathcoachblog.wordpress.com/2012/11/20/the-take-away-game/ Perhaps I need a post of some of my problem solving challenges. Thanks for a wonderful idea. I do have a few questions on the grading end of your homework when you differentiate. How do you grade the actual homework in the classroom when you have kids doing so many different problems? What are some of the challenges you had with grading? How do you keep track of what type/level problem each kid did? How do you deal with a student who did only challenging problems but got them wrong? Thanks in advance ! Sue, differentiating homework can certainly become a logistical problem. But I found that as I taught for more and more years, I was less interested in playing the HW grading game. Rather than worrying about which student completed what tasks, I would rather have students reflect upon their progress. If I did need to have a grade, I would ensure that it was a common problem or two I was checking. I rarely ran into students who completed only challenging problems, and would have a one-on-one conference with students who did, where we talk through a best course of action.